Designed for open air shaking, the New Brunswick Innova 2000 Platform Shaker gives you a reliable continuous duty shaker. Using triple-eccentric counterbalanced drive, this laboratory shaker wont disturb your work environment with loud operation. The cast iron housing of this orbital shaker has vibration free operation, with enclosed electronics and mechanical components to prevent internal damage in the event of a spill. 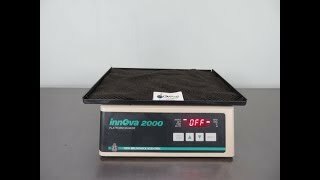 The New Brunswick Innova 2000 Platform Shaker is ideal for conditions where temperature control is not needed, and can be used on a benchtop, in a warm or cold room, or in an incubator. Speed may be controlled through the membrane keypad in increments of 1 rpm, with a range of 25-500 rpm to accommodate a wide range of cell types. The New Brunswick Innova 2000 Platform Shaker can be set for continuous duty, or for timed sessions with audio and visual alarms and automatic shut off. The generous extra wide platform of this orbital shaker can support up to 6 liters and has an orbit of .75". Platform Dimensions 15" x 11"
Dimensions 16 x 14 x 8"
This New Brunswick Innova 2000 Platform Shaker has been tested and performed as expected. If you have any questions, please don't hesitate to contact us.